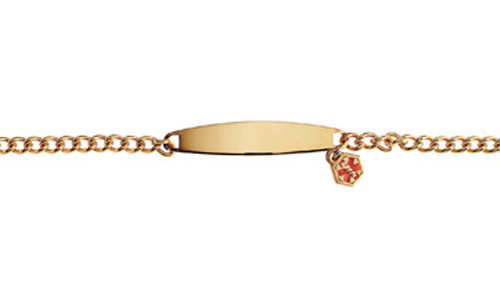 Plaque Size: 1" x 1/4"
This stainless steel, gold plated 7" curb bracelet has a hanging charm as well as an engravable 1" by 1/4" surface. All Doc Tock bracelets come with a medical alert wallet card. All of our engravable Doc Tock bracelets are hypo allergenic. Bracelets use a lobster clasp.